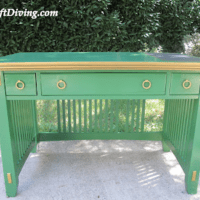 This pretty vintage vanity has been sitting in my garage for over a year. Surprise, surprise. Most things I make over have an excruciating wait time in my garage (a.k.a. “triage”) before figure out what I’m going to do with it, where it’s going to go, and how in the world I’m going to find time to work on it. But thanks to the Snow Gods that dumped 2 feet of snow on us last week, I’ve had off work for 5 straight days. (READ: ample time to create!). And this baby was ‘a callin’! 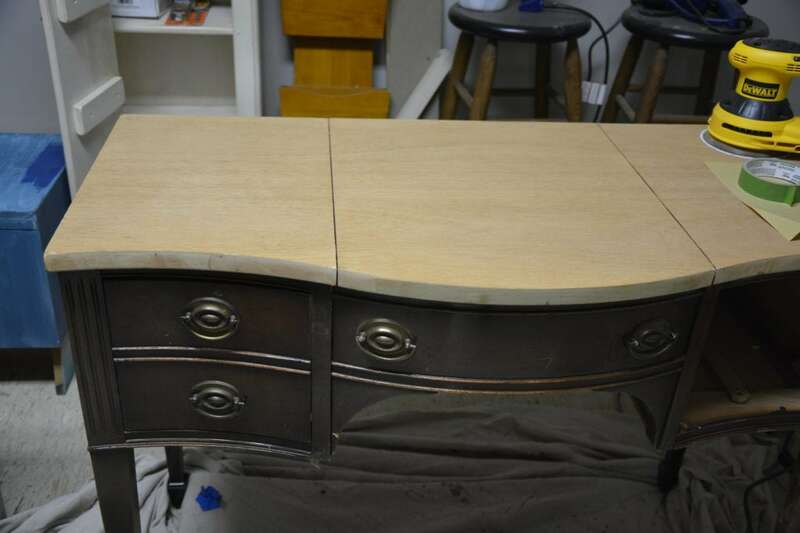 The vanity was really in good condition from the standpoint that it wasn’t falling apart or anything. It was missing a mirror inside, but–meh–who cares. And it didn’t need tons of surgery on it. 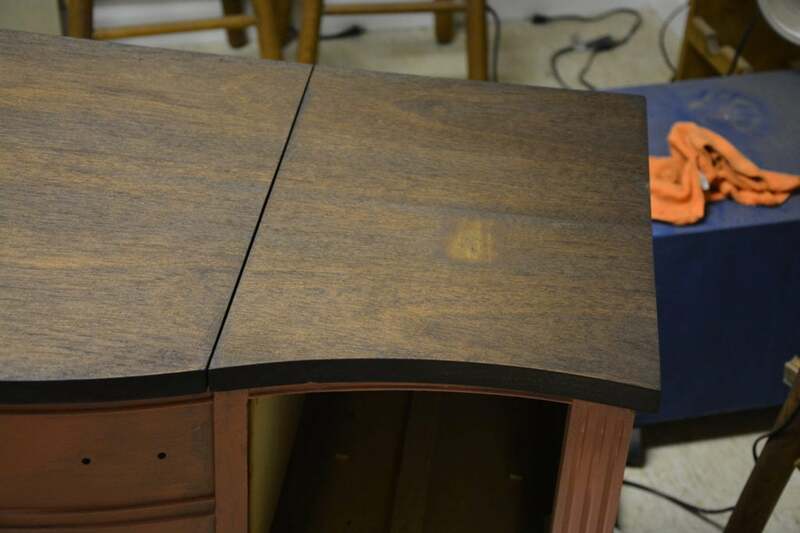 But the top needed refinishing. It had some water rings and some chipping. 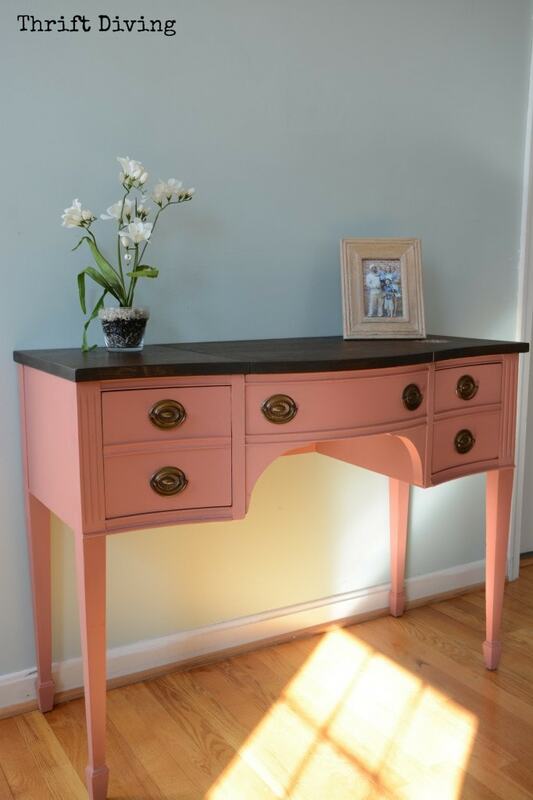 I used Annie Sloan Chalk Paint, Scandinavian Pink. LOVE that color! And my Sherwin William Rainwashed walls really goes well with this color! I’ve come to love stripping furniture! It’s very rewarding. 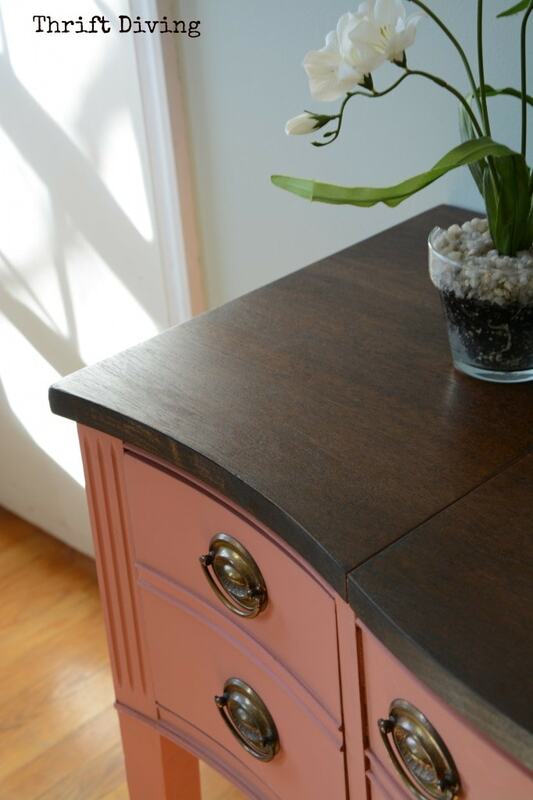 Unearthing that pretty wood underneath, and then breathing life back into it with stain–ahhhhhh………But if you’ve never done it before, just know this: it’s messier and takes more time than just painting over a piece of furniture. However, the results are worth the extra effort. 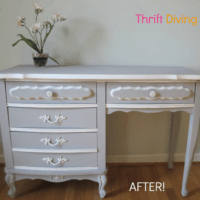 If you need more instruction, check out my blog post and video I did on How to Strip Furniture and Stain It. 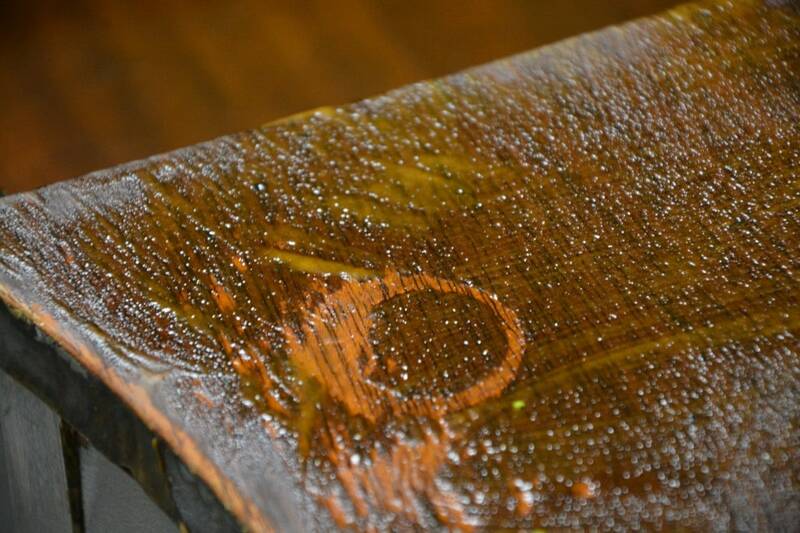 In this pic, you can see how the Citri-Strip paint and varnish stripping gel I used is eating away the previous stain, exposing the natural wood underneath. When it was ready to be scraped, I scraped all that “gunky” stuff with a putty knife. EEEWWWW!! 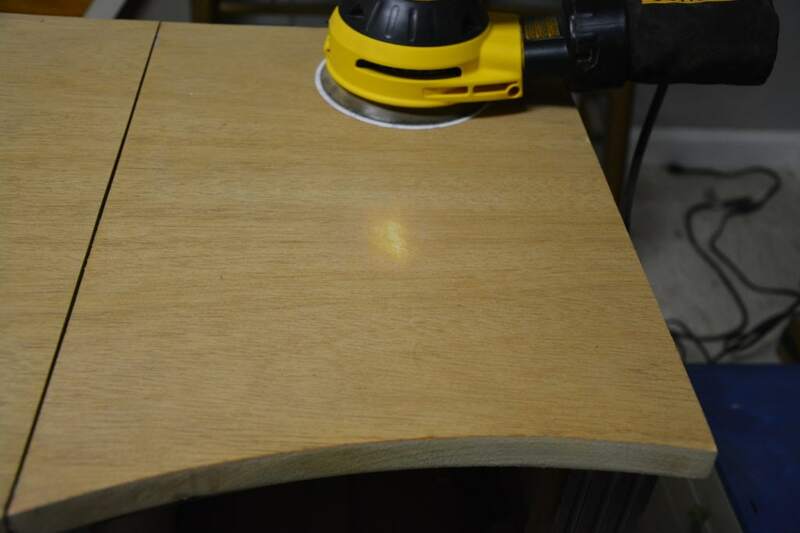 (Be careful–use a plastic putty knife so you don’t gouge the wood. I used metal because it was all I had, but I was super careful). Once I scraped all the gunk off, I gave it a good sanding. 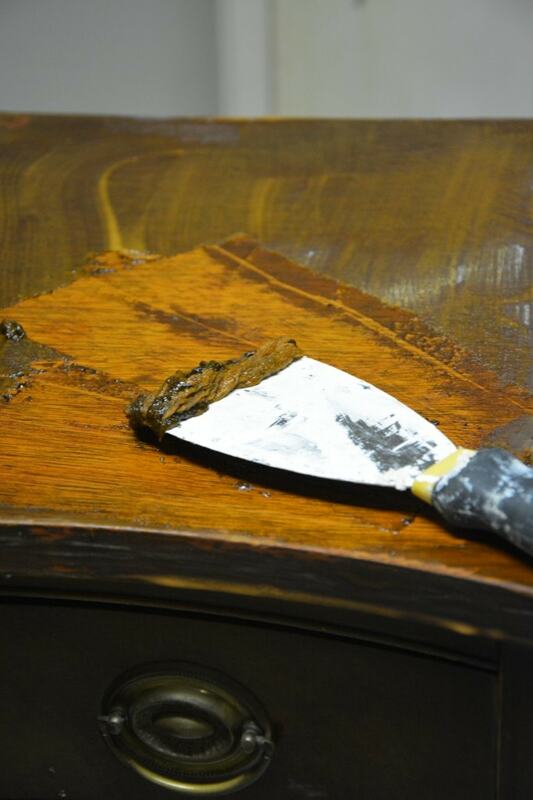 Even when stripping, you’ve got to sand it out to get to this pretty wood. Otherwise, it will still be tinted with the old stain. Crap. I got carried away while sanding and gouged down to the MEAT! The bare meat!! Oh!!! How in the world was I going to fix that?! I was afraid I’d have to scrap the whole “stain” idea and just paint over it. 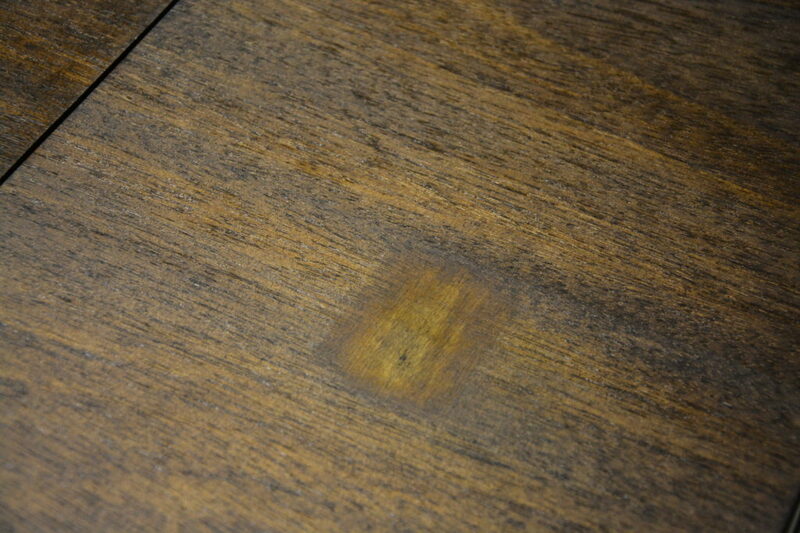 Once I applied the stain (I used Minwax Espresso), I was hoping it would just blend in. It stuck out like a sore thumb! 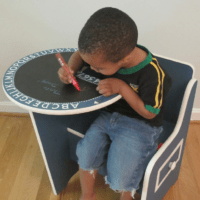 So I Did What Any Creative DIY’er Would Do…. Yep. I broke out the stencils and painted a flower over the top of my mistake, then topped it off with some white highlights to give it some “depth.” Now it looks intentional!!! I’ve never used this product before but wanted to try it out for protecting the top. 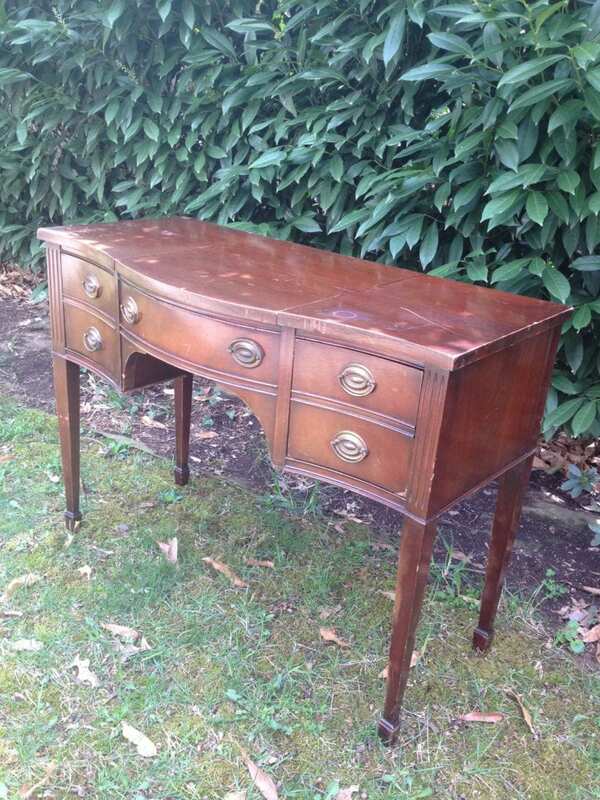 I honestly HATE waxing furniture, so if there is something I can easily brush on and walk away from–I’m game. I was nervous as heck when I painted it on with a paint brush and saw that it was–GASP!–white…and milky! Ummmm……is this going to work?? But it did! It dried beautifully! I wanted something with a bit more shine to it, but after seeing these “AFTER” pics, I think I love the matte look better. 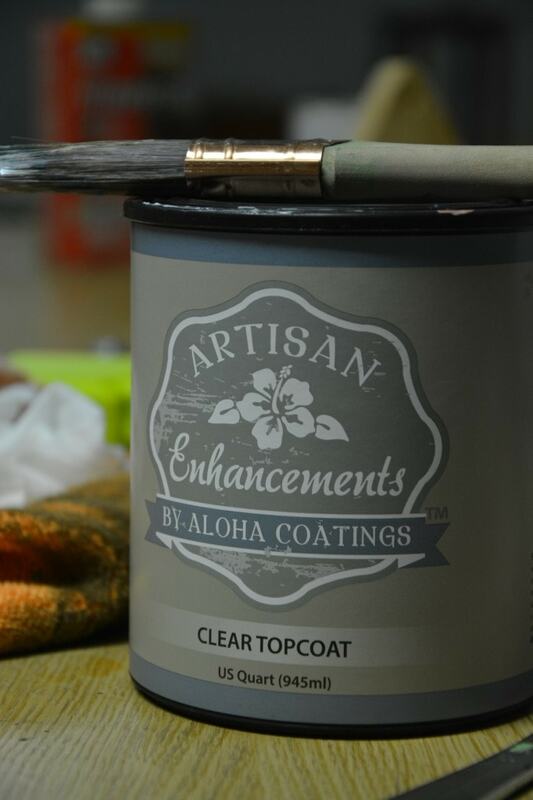 What do you prefer–matte or glossy finished on top of stained wood? 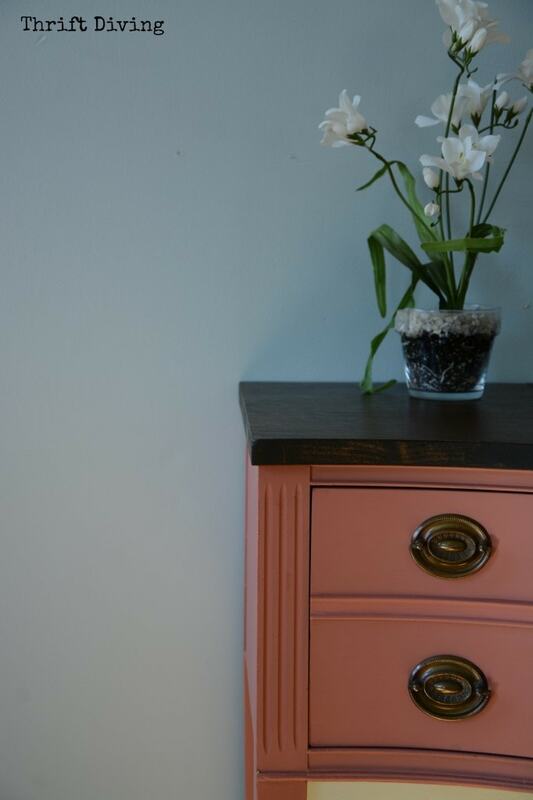 I’m one of those DIY’ers that can’t stand to see a piece of painted furniture with the drawers all ugly and the back looking like it belongs in a crack house. LOL. You don’t have to go crazy and paint every inch of the inside and back (or bottom) but at least make an effort to make the other parts look great, too. I know it adds extra time, but I think it’s worth it. 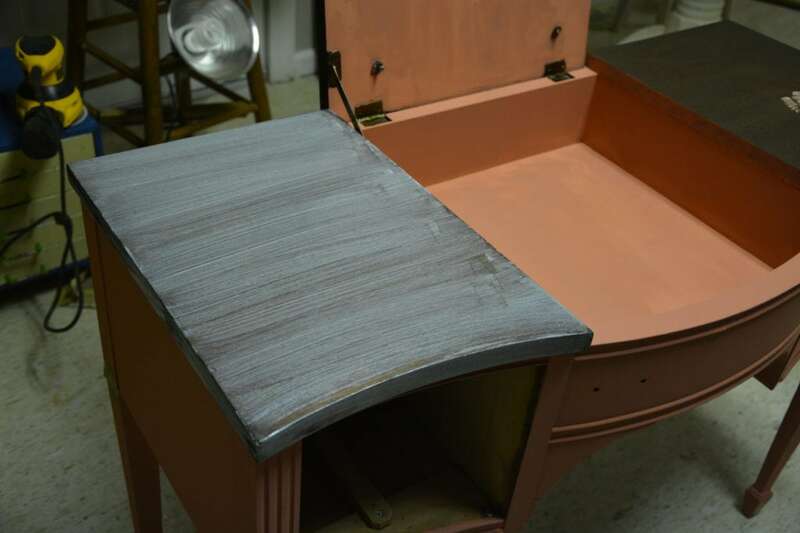 I painted the inside of this vintage vanity in Annie Sloan Chalk Paint, Paris Grey. I just love this color combo! (If you remember, I painted this thrifted bucket gift basket for my mom in the same color combos). For this project, I left the hardware alone. I loved the brassy color, and I liked that it looks a little worn. I didn’t want it to be too pristine and “perfect.” By using the existing hardware, in its original condition, I saved myself time (and money!). 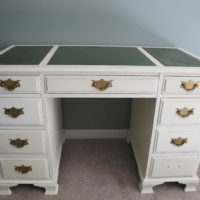 So what do you think of my vintage vanity?! 🙂 Have you ever stripped and stained furniture? 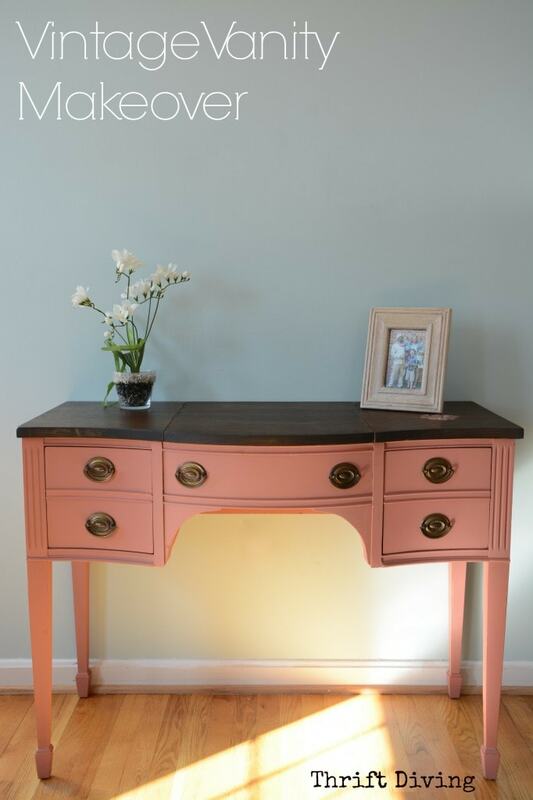 I’ve got a thing for desks and vanities and stuff. 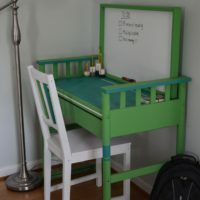 Here are some other desks/vanities I have refinished. Enjoy! 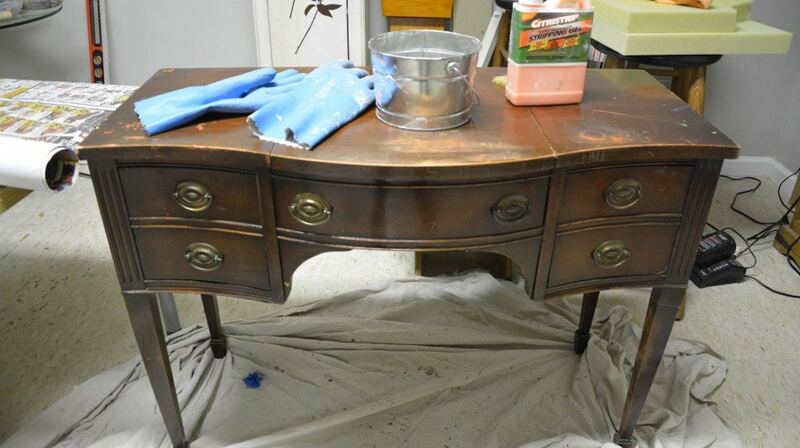 when you painted the body of the vanity, did you remove the old varnish, sand and then paint? Not sure I read anything about that part. Hi Susan! Nope, I didn’t remove any old finishes, I just went right over the old finish! 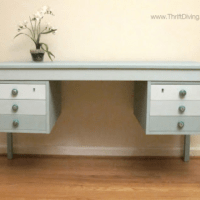 Furniture paint works amazingly that way–no sanding or priming needed! Just make sure you thoroughly clean it first! 🙂 HAHA, I thought I was the only one who says “fantabulous!” Glad to know there are other people who like to toss that word around! Beautiful! I wouldn’t have picked that color but now that I see it done it’s gorgeous! I’ve seen other things done in that color and I have appreciated it but sometimes you just have to see it a few more times to really know that you actually like it. Lol I prefer a satin finish. That piece is transformed! 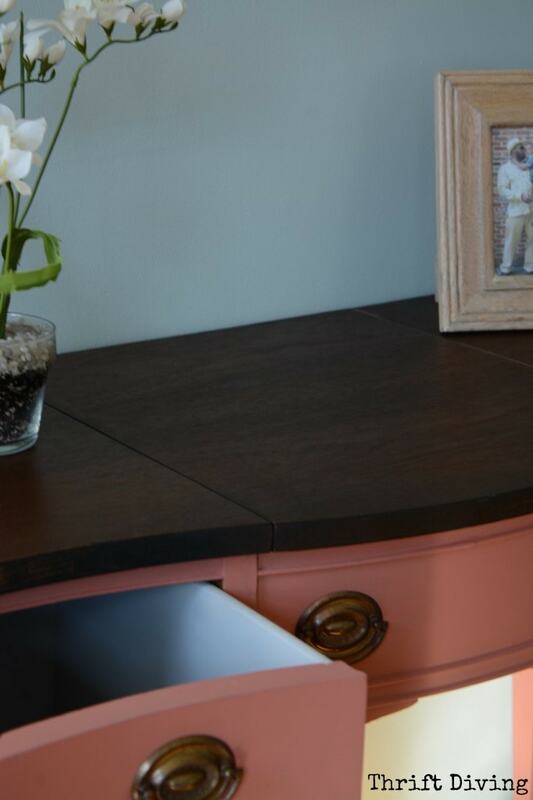 I love the tri-color effect with the dark top, peachy base and grey drawers. 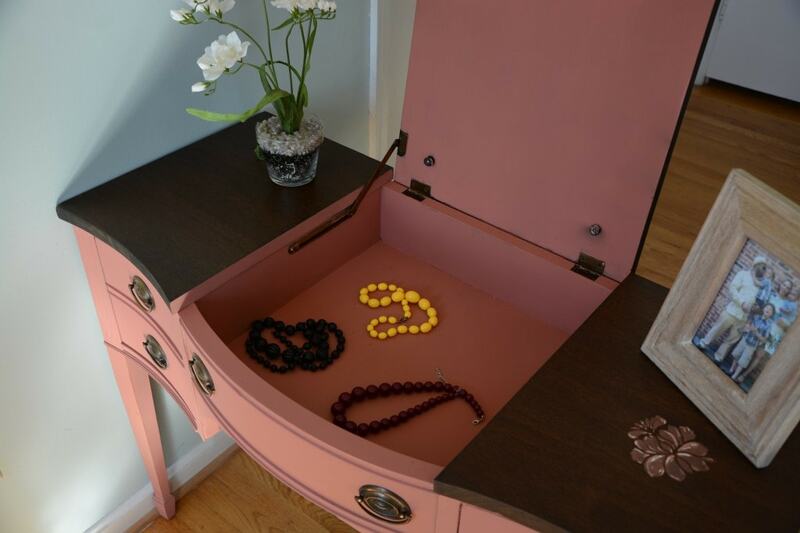 There is something fun about opening a drawer with a different color inside. It’s like a jacket with a surprise lining if that makes any sense. Two feet of snow! That’ll keep you indoors for awhile. Have a Merry Christmas, Serena.